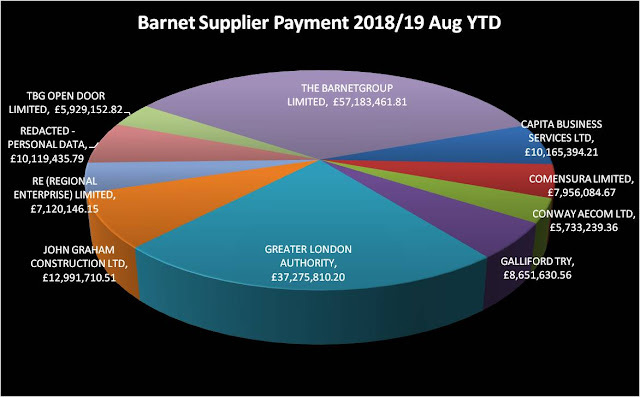 Supplier Payments - Time to look in more detail at Barnet Group. 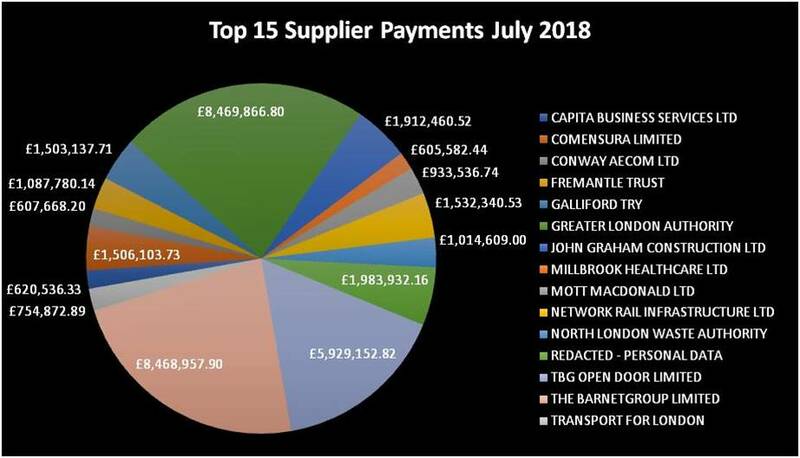 Barnet Council's supplier payments for August were out yesterday. Yet another month when Capita and Re were paid very little (Capita £282,166.04 & Re £294,200). I wonder if something is afoot; either Capita payments are being held back or it is linked in with the current contract review. Next month will be the crunch month as quarterly payments are due. Barnet Group were paid £19.27 million in August, not a record amount but if you compare YTD 2018/19 against Aug 2017/18 Barnet Group have received £9.14 million more than last year, a 19% increase. When you add in the Open Door subsidiary of Barnet Group, the increase compared to last year rises to £15 million or a 31% increase. Given that Barnet are forecasting a £9.5 million overspent this year, and I expect that will rise when we see the quarter 2 figures, they need to start focusing on how money is being spent in the Barnet Group. Comensura are being replaced as the Interim and Agency Staff contractor and hopefully this will bring the costs under control. 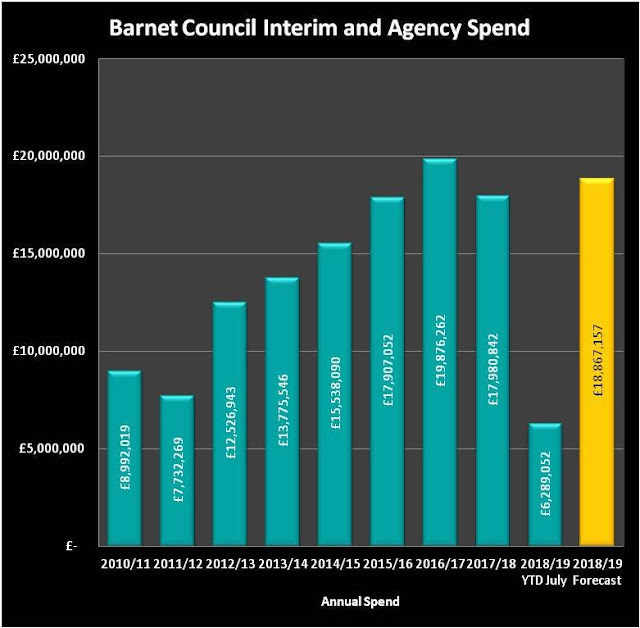 In August, Barnet paid them £1.667 million bringing the forecast for year end to just over £19 million a £1.1 million increase compared to last year when we are being told that interim and agency costs are falling - no they are not! Usual graphs and charts below. Late last year a massive fraud was discovered at Barnet Council. One individual managed to steal over £2 million in 62 separate transactions. I’ll say that again; 62 separate acts of theft, some of which were six figure sums, which took place between July 2016 and December 2017. The individual made requests for payment on fictitious Compulsory Purchase Orders (CPOs). Did Barnet’s systems pick up these multiple acts of theft? No, it was actually discovered by the individual’s bank who queried a transaction and contacted the Council on 18th December last year. The individual worked for the Capita joint venture, Re, and the transactions were processed by the outsourced finance department, CSG, also run by Capita. Having identified very quickly that this was a fraud, Barnet commissioned Grant Thornton to undertake a major review to identify how such a large scale fraud had been able to take place. This project, called Project Rose, was given a budget of “up to” £500,000 and has been on-going ever since. By the end of June the bill was already £225,654. 26 and it looks like significant work has taken place since then. I was made aware of the fraud back in February but nothing was mentioned publicly until April when a major fraud investigation was mentioned at the Audit Committee, although no details were given. The individual who committed the fraud was eventually sent for trial and pleaded guilty on 31 July 2018. He was sentenced to 5 years in prison. “Council officers/the report author determined that Appendix 1 (the Grant Thornton report) should be exempt. Capita has made a request for more time to respond on the accuracy of this document and this was considered”. The report version we have now is “7th Draft” so it looks like there have been long and protracted discussions between Capita, Barnet and Grant Thornton as to what the public finally get to see. I did wonder whether the version we would get to see would be watered down. It may well be, but the version we have received paints a vivid picture of a failure of epic proportions. In total, the report and annexes run to 138 pages. What is interesting is that not only does the report look at how the fraud was able to take place, but it goes much further in examining the contractual obligations of Capita to deliver financial controls and where those obligations have failed. This suggests that the pressure is being ramped up on Capita to hand back parts of the contract. So let’s look at some of the key findings. Grant Thornton have set out five themes for financial control and then detail how Capita have failed on each one. “There was a lack of clarity about both the role of the budget holder and the allocation of budget holder responsibility between Re, CSG Finance and the Council, in respect of regeneration projects and related financial management activity”. This is something I have been raising with the council since the start of the contract. It is a subject that has cropped up in a number of internal audit reports back as far as 2014. “We noted as part of our review, that due to the lack of a formal scheme of financial authorisation, the CSG Finance Treasury Team could not check that the officer requesting a CHAPS payment for a CPO was an appropriate person to do so. There was a check by CSG Finance Treasury Team against the approval levels for the recorded on Integra,(Capita’s own IT system) but this was not an adequate check in the absence of a formal scheme on which Integra authorisations should have been based”. This is such a basic error that it is shocking when you see it in such a large organisation. “During the period of the fraud, there were no CHAPS (a faster version of BACS for same day bank transfers) procedures or task checklists in place for those working in CSG Finance Treasury to guide them through the CHAPS approval process. This resulted in the officers loading bank details onto Bankline and authorising and releasing payments who were unclear on their checking and verification responsibilities”. Just remember we are talking large sums of money here, typically tens of thousands, with the largest being £124,750. It is beyond belief that there were no written procedures or checklists for checking and verifying who was authorised to request such large sums of money. “We found that schedules of expected property acquisitions did appear to be held by Regeneration Managers, in some form although this tended to be on non- standardised spreadsheets. Finance officers we interviewed in CSG Finance Treasury and the Business Partner team were not aware of the existence or potential application of these schedules, which could help them monitor the value and timings of large payments, including through the CHAPS process. We would expect lists such as these to be to be used to cross check spending on regeneration cost centres as part of the budget monitoring process”. So they didn’t even check against a list of properties to be acquired to make sure which payment related to that property. That a basic error and not one you expect of a FTSE250 outsourcing company. “Where payments were processed via CHAPS there has been no direct verification with the supplier/vender (e.g. by telephone) to confirm the bank details are correct. The payee’s bank details were not checked against independent information. This control alone would have prevented the fraud”. Again, a simple common sense check that simply was not undertaken. "In the cases of reporting to both Growth and Regeneration Oversights Board (GROB) and the Performance and Contract Management Committee, the information is relatively high level and therefore significant onus is placed on CSG finance business partners to challenge the narrative on budget variances provided by budget holders, for the cost centres they are responsible for." I have attended most of the Performance & Contract Management committees and there is seldom any real challenge from councillors. Part of the problem is that they are given so much high level information and in ever changing formats that even if the information was available I am not sure they would spot it. In the absence of this detailed understanding of Re transactions, CSG finance business partners will be unable to effectively challenge the narrative provided by the regeneration manager, weakening the review control that could identify error or fraud. As CSG Finance act on behalf of the Council in this capacity, this in turn exposes the Council to significant risk”. So we have appointed people to act on the Council's behalf and in the residents' best interest but one part of Capita under the CSG contract has failed to challenge another part of Capita under the Re joint venture. These types of conflict were predicted at the outset, now they have come true. “The current Business Director for Regeneration, with overall responsibility for regeneration projects, had only nine months experience of regeneration and was not directly involved in reviewing the financial management activity of his managers or the Individual, in regard to regeneration budgets and related ledger codes. In its current form this role is geared more towards commercial account management, focusing on the contractual relationship with the Council and not with detailed functional and technical oversight of the projects themselves”. So we are paying for a skilled team of experts and what we got were inexperienced sales people. “A number of officers in CSG Finance and Re commented during our meetings that they were aware of control weaknesses (for example, through Internal Audit findings or their own observations) or recognised in hindsight that control weaknesses should have been identified and addressed. This report describes several situations where a higher level of professional scepticism and rigour on the part of senior managers within Re and CSG Finance, could be reasonably expected to have identified and challenged unusual and potentially suspicious transactions – notwithstanding weaknesses in formal controls and CSG Finance when approving journals, payments and system access, and when reviewing budgetary performance. Some of this may be attributable to the turnover of personnel in key roles and the lack of effective knowledge transfer”. This is what I call, “Don’t give a s**t syndrome” something that is not uncommon when people have no direct link with the organisation they are managing. Creating a culture where staff are both engaged and empowered to act when they see problems is what we should aspire to and something that can be delivered. "In our view, there has also been insufficiently close scrutiny and client side management on the part of the Council and the Chief Officers coupled with an over reliance on the limited scope and frequency of work carried out by the Internal Audit service, to highlight issues. This is likely to have contributed to the lack of focus on effective controls". What I want to know is where were Capita’s Internal Audit and Anti Fraud teams as they also have responsibility for these contracts? I have been raising questions on these types of concerns for years at both the Performance & Contract Management Committee and Audit Committee meetings. Consistently my questions and concerns have been ignored, patronised or dismissed by a council that was in denial about any failings of the precious outsourcing contracts. We now know the truth and it is all bad. “It is entirely appropriate that the Finance and Revenues & Benefits functions are included in the cluster of services to be outsourced, as this is the option that it is believed will best deliver the desired outcomes for these services. It is true to say that they are already relatively high performing and relatively low cost, however there is potential for improvement to make these services higher performing and lower cost than they already are, and the options appraisal recommends that outsourcing these services is the option that will best enable this desired outcome to be delivered”. Seven years on and these are definitely not the desired outcomes. I and other bloggers and activists have been highlighting the risks with this contract from day one and the entirely inadequate business case built on assumptions and aspirations that have proved nothing more than exactly that. In April 2012 I flagged up the financial control risks in the speech I gave to Audit committee which I republished in November 2012 and which can be read here. Based on the Grant Thornton report it looks like my concerns were entirely justified. I have no confidence in senior Councillors who have exhibited hubris and contempt over the years and, as such I think it is time for a complete review of the committee system and the people who chair those committees. We need people who are prepared to challenge officers, to query facts to scrutinise properly, not people who are seeking favour and a special responsibility allowance. We also need to look closely at the Council’s senior management team to see if they are up to the job (Interim Finance Director excepted). We need strong leadership from people who can command respect and engender commitment, something which I do not see that at present. The Council are currently reviewing which of the Capita and Re services should be brought back in house. What worries me is that this report has only addressed two functions - the Finance and Regeneration departments, one in the Re contract and one in the CSG contract. Are the issues identified by Grant Thornton a symptom of a much wider problems across all the functions of the CSG and Re contracts (and for that matter the Cambridge Education contract)? I reckon they probably are. Outsourcing has been tried and in Barnet it has failed. We have inadequate services, a culture of denial and procrastination. It is time to draw a veil over this experiment in political ideology and start building a new council structure that will deliver the services we need with the massive budget cuts we still face. Why save £900,000 a year when you could save £300,000. Ah well that's the politics of Barnet. On Thursday night Barnet agreed to 'suspend' food waste collections for an indefinite period while they look at how they can meet the 2020 recycling targets. Of course this was just a wheeze so that they can say they haven't scrapped the food waste collection service, but it fools no one. I have blogged about this back in June and last week when I submitted questions to the committee. In the supporting papers they said that stopping the food waste collection would save £543,448. This was then revised down in the summary because I have consistently challenged the assumptions they used in calculating the cost of disposing via anaerobic digestion versus incineration. So they are now saying it will save £300,000 a year. Quite a lot, but I looked at the costs and found that £130,000 is spent on collecting food waste from properties with restricted access. If they have to make a saving then focus on the exceptional costs rather than removing the service from everyone. I also had discussions with the anaerobic digestion company. Together we identified a further £68,000 of costs that could be stripped out almost immediately. So that brings the cost down from £300,000 a year to £102,000. If Barnet could boost food recycling rates there would be a very real chance of the service breaking even. I put forward all these arguments but a political decision has been made and logic and common sense is ignored. Cllr Zinkn got quite angry with me at one stage and suggested that I hadn't read the papers when I suggested their supporting evidence for the environmental benefits of incinerating food waste was poor. One of the reports was a metadata study or one that collates the evidence from a number of research studies. To me, saying I don't read the papers is the worse insult of all because the one thing I always do is read the evidence. In my questions I had drawn attention to the fact that, yes, it was a metadata study but it was carried out in 2004 and published in 2005. As a result all of the evidence would have come from studies carried out before 2005 and possibly some from the last millennium. As I pointed out in one of my questions, in 2005 the anaerobic digestion industry in the UK was almost entire dominated by digestion of sewage sludge. There were just 2 digesters operating that were for non sewage sludge. In 2018 there are 449 non sewage sludge Anaerobic Digesters in the UK and 106 commercial/ municipal ADs. It is a completely different industry today with technology that has moved on dramatically since 2005. Sewage sludge also has very different properties to household food waste. It is a bit like using a metadata study on the smartphone industry in 2005, before the iphone was invented, on which to base decisions on smartphone usage in 2018. 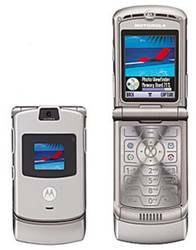 (The Motorola Razr V3 was apparently the bee's knees in 2005). There are a number of studies which show the environmental benefit of AD and it is generally recognised as being preferential to incineration. I have set out just one below but it is also important to understand that DEFRA (page 10) also ranks AD above composting and incineration. The senior officer also made some statements about the gate fees (the costs charged for waste disposal) and the sustainability of the anaerobic digestion charges. I had checked with WRAP who carry out an annual gate fee survey and they seem to bear no similarity to the figures quoted by the officer. I spoke with the AD operator who said they make their money from electricity generation. Wholesale electricity prices are rising and with the uncertain future of the nuclear power industry and the growth in demand for electric cars, the future for wholesale electricity prices looks positive form their perspective. It is also important to bear in mind that the digestate (residue left over at the end of the digestion process) is nutrient rich and is a very attractive alternative to artificial fertilisers typically produced using fossil fuels. All this digestate is sold on long term contracts to farmers. To cap everything Barnet have refused to participate in a review fully funded by the GLA to look at ways that Barnet could retain this service. It suggests to me, and I suspect many others, that Barnet do not want to expose their figures to scrutiny because it will become apparent that they are not robust. Barnet have also conflated the withdrawal of the food waste collection with the reorganisation of the refuse collection rounds. Based on the methodology for making the savings, which is to remove the dedicated food waste collector on each vehicle, the food waste decision would make no difference at this time. Cllr Dean Cohen said that the waste collection routes weren't just inefficient because of the move from one depot in Mill Hill to two depots one on Harrow and one at Oakleigh Road but that the routes had been inefficient for years. My question would be if that is true why on earth hasn't this inefficiency been addressed sooner. I am not an expert so I also sought out advice from an expert who understand the rounds in detail and who concurred that the waste round reorganisation could go ahead irrespective of the food waste collection decision. And then we come to my final point which is why the council ignored a potential £900,000 saving which could be delivered by moving to fortnightly waste collections. 76% of councils in England who have responsibility for waste collection have moved to fortnightly general waste collections. This helps to encourage higher levels of recycling especially when tied in with weekly food and recycling collections and cuts costs. Environmentally and financially it makes most sense. I asked Barnet why they had rejected this option and their response was "The retention of a weekly residual waste collection service was a Conservative manifesto pledge as voted on by the residents of Barnet". So residents voted not to save £900,000 even though we are facing a massive financial crisis where Barnet has to make £67 million of cuts in the next three years and this year alone the forecast is for a £9.5 million overspend. When decisions like this are made it makes me despair of where Barnet is going. "During the recent local elections, however, the Barnet Conservative manifesto included a commitment that weekly refuse collections will be maintained, and that the proposed Alternate Weekly Collection (AWC) referred to in the November 2017 Environment Committee Business Planning report will not be introduced. Based on the results of the election, this commitment appears to have support from local residents." I think that is a pretty desperate assumption but this is Barnet. Barnet are also claiming that the reorganisation of waste collection rounds has been held up by the decision on food waste collection and they are asking the Mayor of London to pay £265,000 in compensation. My argument is that the reorganisation of the waste collection round should have happened a year ago when Barnet moved out of Mill Hill Depot and split the service between Oakleigh Road and Harrow. Ceasing food waste collection would have meant removing one member of staff from each recycling lorry crew, not changing the route. This seems like an entirely retrograde step; it's not environmentally friendly and it risks costing us a fortune if the law changes in the future making separate food waste collection a requirement (which seems very likely). I have submitted a number of questions set out below. I will look forward to seeing what answers I receive. If Barnet stops separate food waste collections now, what would be the cost of reinstating this service if, at a later date, legislative change requires separate food waste collections? If Barnet mix food waste with general waste how easy would it be to introduce fortnightly general waste collections in the future if financial pressures required this? Please can you clarify whether the Mayor of London has confirmed that he will not take legal actions against Barnet if food waste collections cease? As part of the risk assessment on this decision have you calculated the potential legal cost of any challenge by the Mayor if you do stop food waste collections and if so how much have you estimated this might cost? In Mr Hooton’s letter of 3 September to the Deputy Mayor, he stated that the knock on effects of the decision on food waste collections had prevented the implementation of the new rounds. What evidence is there to support that statement and the demand for compensation given that the biggest driver of round rationalisation was the move from one depot to two, not the cessation of food waste collections? The report makes it clear that £900,000 a year could be saved by retaining weekly food waste collections and moving to fortnightly general waste collections. There is also widespread and consistent evidence that this can be an effective way of boosting recycling rates. Given that 248 out of 326 local authorities (76%) across England with responsibility for waste collections run fortnightly general rubbish rounds for some or all households, what makes Barnet different from the majority of other local councils? Can you confirm that the gate fees for food waste sent to anaerobic digestion are £58 per tonne cheaper than sending food waste for incineration and that the reduced gate fee accrued this year will be credited to Barnet in next year’s NLWA levy? At Appendix K the cost savings are stated for the full year 2018-19 at £543,448 yet at Appendix D it states that the savings could be £296,848. Given that the figure in Appendix K appears to take no account of the reduced gate fees for food waste sent to anaerobic digestion it gives an entirely false impression of the potential savings. Can you clarify the basis for this figure and why it differs from the figure provided to me on 22 August? £130,000 of the alleged £296,848 savings relates to the withdrawal of food waste collections on “Restrict Access Rounds”. Can you clarify where those rounds serve, why the food waste collection savings would be so high and whether consideration was given to only ceasing food collection on those rounds rather than the borough wide service? Did Barnet’s legal team review the letter Mr Hooton sent to the Deputy Mayor and did they review the basis of the £265,000 compensation demand made by Mr Hooton? Can you clarify where anaerobic digestions sits in the DEFRA Waste Hierarchy compared to incineration of food waste and whether that changes if the digestate meets the AD Quality Protocol? What steps have been taken to identify if the current AD operator meets the AD Quality Protocol and if not, how easy it would be to achieve. One of the academic studies cited in the report at Appendix Lii was carried out in 2005. In 2005 there were only 2 Anaerobic Digesters operating in the UK outside the water industry (i.e non sewage sludge). In 2018 there are 449 non sewage sludge Anaerobic Digesters in the UK and 106 commercial/ municipal ADs . Given that the industry has changed dramatically since this study was written does it give an accurate representation of the facts? The academic study at Appendix Li is based on one study in Italy. The study appears to have assumed that AD is followed by composting of the digestate which appears to be a different model compared to the UK AD industry. It also appears to ignore the value of the digestate as a direct replacement for artificial fertiliser. As such are you sure that this study is a suitable example on which to base a decision in the UK? Have the Council taken legal advice as to the likelihood that a revised EU directive on waste (and specifically a revised Article 22 requiring separate food waste collection) might become a condition of a negotiated free trade agreement with the EU? The National Infrastructure Commission has recommended that government should establish separate food waste collection for households and businesses (to enable production of biogas) by 2025. How would Barnet respond to such a requirement? Have Capita been involved in any of the discussions regarding the cessation of food waste collections and will any decision taken create a gainshare liability? In 2013 Barnet spent a total of £11 million introducing the blue and brown bins, a new fleet of refuse vehicles, advertising and education programme. Before the introduction of this service recycling rates were 33%. If you cease the food waste collections the recycling rate will be 33.6%. What specific initiatives will you implement as a result of ceasing food waste collection that will help Barnet get anywhere close to the target of 50%? Since the new recycling service was introduced in 2013 how much has been spent on encouraging Barnet residents to recycle in the form of: advertising; promotions; leaflets; recycling ambassadors; activities in schools; talks to clubs and voluntary organisations; organised trips to the recycling centre and anaerobic digester etc.? The Action Plan identified at Appendix A seems to lack any tangible activities initiated by Barnet to encourage householders to recycle more. Why has so little emphasis been placed on such an important target group? Have Capita been involved in any of the discussions regarding the reprocurement of the advertising contract and will any decision taken create a gainshare liability? Barnet's latest supplier payments have been published with a total of £58.28 million spent last month. There were very modest payments for Capita (£620k) and Re (£382k) as no quarterly contract payments were made. What is of real concern is the continuing cost of agency and interim staff. Payments to Comensura were £1.5 million in July but I have also seen their payments for August which were published yesterday. All the indications are that the total bill for the year is likely to hit £19m, a million more than last year. 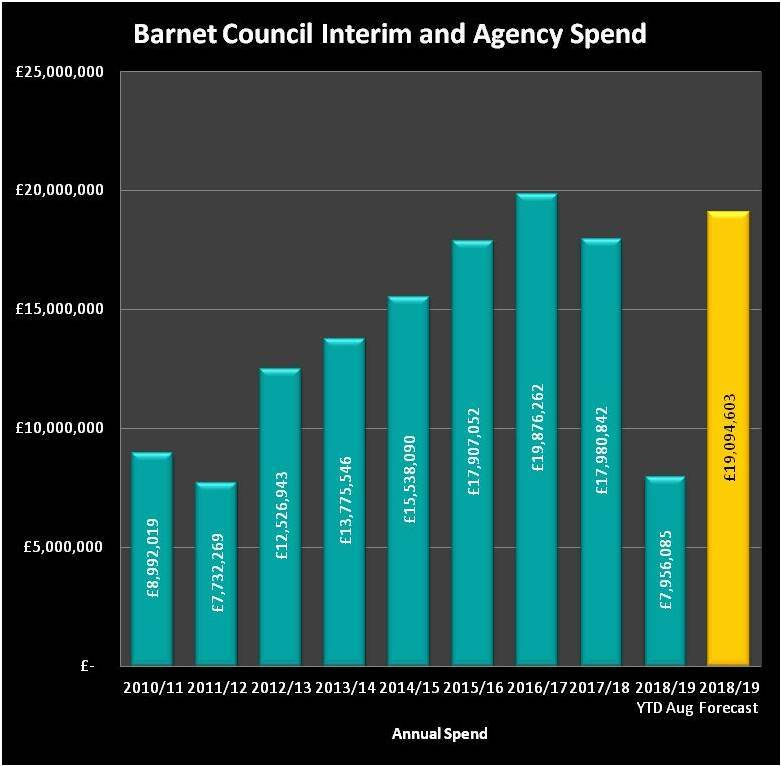 Barnet have a massive financial black hole and interim and agency staff costs are just one area that have to be reduced significantly if they are to meet the cost saving targets. If this is an indicator of the ability (or inability) to deliver the other cost cutting measures, I suspect that the financial crisis may hit sooner than we think. Usual month charts and updates below.